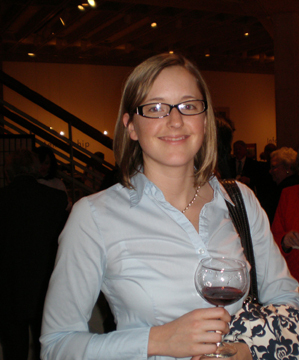 Last Wednesday Megan and I treated ourselves to a fun wine and cultural event at the Virginia Museum of Fine Arts. The event, which included a tasting of 10 wines and some fabulous hors d’ oeuvres, was to promote the book The Art of Drinking by Philippa Glanville. The evening started with a one hour lecture by Philippa that was extremely fascinating and educational as well as quite amusing. Philippa had a great ability to mix in her British humor with the loads of information on how the act of drinking alcohol has changed throughout time. The majority of her focus was on the 16th and 17th centuries and then briefly touched on the eras closer to the current day. In the 16th and 17th century drinking alcohol was a key part of people’s lives as water was sometimes unfit to drink. Alcohol, mostly in the form of ale or wine, was a part of your pay stipend as well as present at every meal except for breakfast, and was an important nutritional source, particularly for the lower classes. In addition to the social aspect of drinking, her lecture and her book focus on the vessels that surrounded the culture of drinking. Whether it be the very ornamental drinking glasses (although glass was rarely used before the 19th century because it was more expense to manufacture versus pewter and silver) or the vessels that people used to store and transport wine since it was not served in single servings. Alcohol is a mood changer, a pleasure of the flesh, and a metaphor for indulgence. It has enhanced life; stimulated a flood of art, advertising, and interior design; generated new objects from the corkscrew to the cocktail shaker; and fueled vivid celebrations of rites of passage, victories; and state occasions over the past 500 years. The Art of Drinking is a celebration and exploration of the extraordinary range of visual material created to exploit, celebrate, sell, and simply enjoy alcoholic beverages. On the whole the wines were okay but nothing special. The 3 standouts were the Weinert Merlot 2002, the Warwick Estate Sauvignon Blanc 2007 and just out of the sheer cool factor the Chinese Dragon’s Hollow Chardonnay. Megan and I had a great time, learned a lot and tasted some new wines, what a fabulous way to spend an evening.